Day two of the World Series would have the number 4 seed, Renegades play the 13 seed BCS (Bryant College Station, Texas) Outlaws. BCS came i to this match with a 1-2 record with their win coming about 30 minutes prior to this game over the Seattle South King Sluggers by the score if 8-1. This game would take place across the street from the main complex in the outfield if a baseball field with our home plate being placed in dead center field. The grass on this field was much thicker and would make this a defensive game for sure. The Renegades would be heavy favorites here over a young Outlaw team. Christian Thaxton would make his World Series debut after getting medical clearance to play and he would try to get the rust off after not swinging off live BP for almost two weeks. BCS would strike first as their first 4 hitters put the ball into play. Justen Proctor gobbled the first two up but then Hillary House hit a fly ball which Joe McCormick could not find in the tall grass. Jason Walters then hit a ball that Joe Quintanilla could not grab. A confident Outlaw team drew first blood and led 2-0. The Renegades started slow as Thaxton went down on 4 pitches and Joe McCormick whiffed in 4 pitches as well. 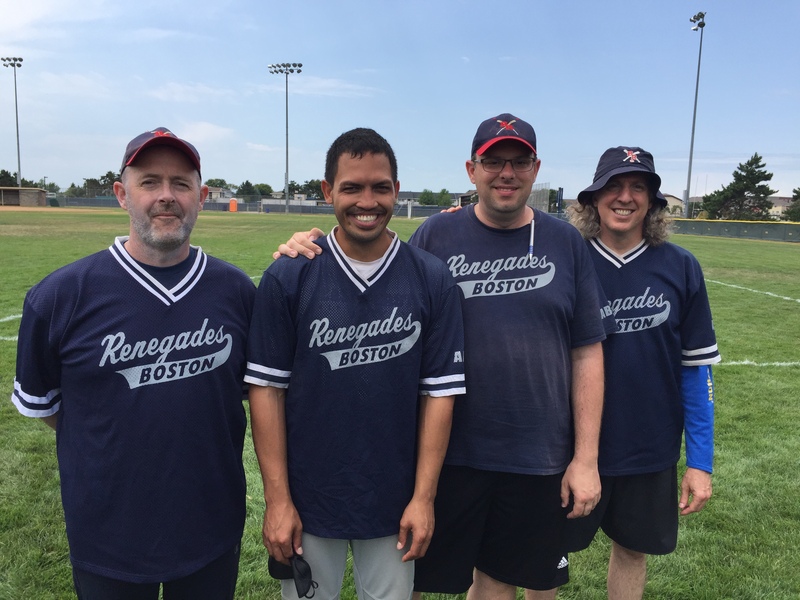 Rob Dias scored on a line shot to left and then Shawn Devenish went down swinging on 6 pitches. Justen Proctor asserted himself in the 2nd making all three stops on defense. Joe Quintanilla hit a line drive to the right side on the first pitch of the bottom of the second, but he lacked enough speed and was put out. Proctor started this game in the line up and hit the first pitch he saw but came up empty. Thaxton managed to get this ball into play but the tall grass and good BCS defense ate it up and the GADES went down 1-2-3 and were behind after 2 innings 2-1. BCS was making more consistent contact but the shorty combination of Justen Proctor and Rob Dias would send them down 1-2-3 in the third. Joe McCormick would tie the game in a deep ball into left to lead of the bottom of the third. Weissman knew this game was going to be close and pulled Quintanilla in favor of Joe Yee. Yee was having a monster year with his cousin, Peter Connolly pitching. The result of this at bat ended in a strike out. In the 4th, the trend was Proctor and Yee as they tallied all the outs. Till this point in the game, Proctor had 9 stops. Dias had made a pair and BCS only struck out once. This young team was holding their own. Justen Proctor would then get his biggest hit of the year scoring on a line drive to start the 4th inning off Peter Connolly, for Connolly’s only run in this contest. Thaxton then scored his first run if the series on a deep fly to right center. Boston led 4-2. Both teams would continue to put the ball in play, but neither would score for the remainder of the game. Boston would hold on to a tight 4-2 victory. Justen Proctor would tally a total of 12 stops and would end the game making a crazy stop on a line drive off his leg off the bat of Drew Bernet. Those 12 stops tied a Renegade record that stood since 2004 from Darren Black. In those days Black would play in a different defense which allowed him more chances. So in reality, this effort was more impressive. In addition to this, the Gades set a team record making 16 defensive stops in a 6 inning game with Dias picking up a hat trick and Zuccarello adding one of his own. After the game, Peter Connolly would see the end of his World Series. Many of the Renegades took bp off Ron to work on their timing. Thaxton took a lot of BP to help him get his groove back after a 1-4 performance. The team played well enough to win but really lacked energy. This would be concerning heading up against the Indy Edge in its next match. 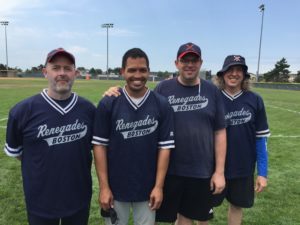 For now though, the win sent the Renegades to the next round of double elimination and allowed them to take the afternoon off. That proved very big as huge thunder storms would postpone all games to start at 7:00am the next day. Boston was able to rest and reload.